Offering you a complete choice of products which include henna hair color. Henna hair colors in order to serve the needs of our foreign customers with world-class packaging processes, we maintain high standards for our customers and concern for health, safety and the environmental impacts of our products. 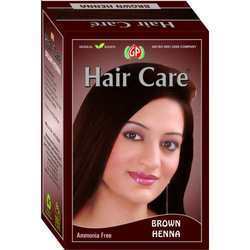 Packing is available as per customer requirement, besides in our regular famous brand "hair care"
"Haircare" brand10gms packing:"haircare" black henna, dark brown henna, brown henna, chestnut henna, burgundy henna, mahogany henna, are available as under - 1 pack of 60 gm contains 6 pouches of 10 gm each. 100 packs of this size make 1 master carton. Other size packing : Our henna hair colors is also available in bigger size packing like 100gms packing, 500gms packing, 1kg packing. Above packing will be in high class international export quality pouches these pouches available in many different colors like silver, golden, red, yellow, blue, black, mahogany. For more information about our pouch colors and to check them kindly check our factory tour page in our web site. Bulk packing : We also pack our henna and henna based colors in bulk packing like 5kg bags, 10kg bags, 20kg bags and 25kg bags. For bulk packing we use high class big poly bags so the quality of our henna can stay long time.